We visited Milestone two weeks ago, then we came back again last week—and in those two weeks our lives have changed. The “Who Am I?” series has not only impacted my husband and I, but our kids have been changed as well. 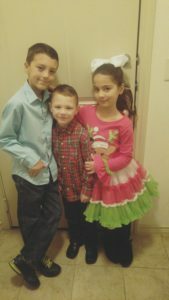 We have five amazing and beautiful children. 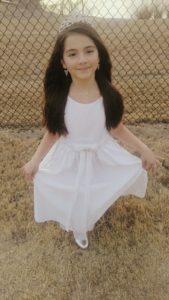 Abriella (Abbi) is our 8yr old. 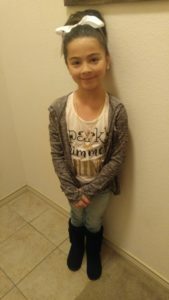 She loves to read, she’s a girly girl, but she also loves to go fishing with her dad…so she has some tomboy in her as well:) She’s extremely affectionate, she loves helping people, and she loves giving hugs. 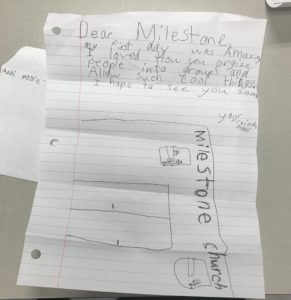 The first week we visited Milestone, Abbi went to her class for 2nd graders, and told me all about the singing, Detective Chris P. Bacon, and how she searched for clues about who God wanted her to be. But at the end of the class, something amazing happened. Abbi prayed and gave her life to Jesus. Abbi has been reading her Bible NON-STOP, and she even holds it when she sleeps at night. As a parent, I’m so grateful for what God has done in her life, but I’m also grateful for the way Milestone has embraced and loved our family. We’ve finally found our spiritual family, and we can’t wait for what God has next! My first day was amazing. I loved how you organize people into groups and allow such cool things. I hope to see you soon. So very sweet. It reiterates why we do what we do! How awesome! I love how great our children’s ministry is. And I love seeing young children coming to know the Lord at an early age! Great testimony!